The first exclusively graduate school of international affairs in the United States, The Fletcher School of Law and Diplomacy opened in 1933 as a professional training ground for internationalists at a time of isolationism. Over the remainder of the 20th century it earned a reputation as a global center of excellence. Today, Fletcher is the most multi-disciplinary APSIA school, delivering on its promise of preparing global leaders by fully embracing five disciplines that are core to an international affairs education—political science, history, economics, business and law. These are the foundation for the School’s degree programs: Master of Arts in Law and Diplomacy (MALD); Master of International Business (MIB); Master of Laws in International Law (LLM); Doctor of Philosophy in International Relations (PhD); the mid-career Master of Arts (MA); the Global Master of Arts Program (GMAP), which integrates residency with internet-mediated instruction; and the Master of Arts in Humanitarian Assistance (MAHA), offered jointly with the Friedman School of Nutrition. Fletcher’s wide-ranging fields of study include security, development, conflict resolution, environmental policy, human security, trade and finance. The School’s flexible curriculum combines academic rigor with professional training so that students master both theoretical and practical approaches to global problem solving. Fletcher students study in the academic capital of the United States, a vibrant setting that provides unparalleled learning opportunities. The School attracts bright young professionals from around the world with its culture of intellectual engagement; a curriculum that prepares students for their next job, their best job and a life of impact; a faculty immersed in scholarly and professional communities; and the camaraderie and strength of ties in its international alumni network. Fletcher’s long list of illustrious alumni includes heads of state, top government and international officials, chief executive officers of major corporations, heads of nonprofit organizations, senior military commanders, and renowned scholars. Fletcher has benefited from being a part of Tufts University throughout its first 80 years. Our ties with other schools of the University continue to grow. Building on this rich foundation, our vision is to be the premier institution for preparing a highly selective and diverse network of global leaders, whose influence is felt across the public, private and non-profit sectors. These future leaders will be equipped with cutting-edge inter-disciplinary analytical skills; historical, technical and cultural knowledge; and a practical problem-solving orientation. Together with our international network of graduates, friends and partners, faculty and students will have an enduring and positive impact on people, institutions, states and international entities. The Fletcher School will be instrumental in promoting stability and prosperity in an increasingly interdependent global society in the 21st century. At the same time, the dynamism of emerging powers and their growing clout in the international system may make a Fletcher education accessible and desirable to new segments of prospective students. Communications technologies and outreach efforts led by the Dean will help the School reach some of these segments as well as connect the Fletcher faculty with policymakers and executives worldwide who are seeking solutions to the most pressing global problems. Academic and non-academic partnerships will enable the School to amplify its impact by realizing synergies with a network of institutions working in complementary areas. In addition to taking advantage of opportunities, the School must address several challenges in order to continue to thrive in the coming years. The School must respond to prospective students’ concerns about the affordability of a Fletcher education and the career options that await upon graduation. These concerns have become more pronounced in the post-2008 economy. The School must also ensure that its reputation and offerings continue to resonate in an increasingly crowded environment for higher education. The proliferation of international affairs programs and increased focus on global issues in business schools have led to greater competition for prospective students. 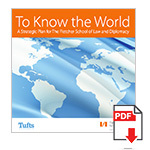 In some countries, Tufts University and the Fletcher School are not well-known. Furthermore, technology is enabling less expensive institutions and vendors to compete with residency-based programs. All of these factors make it more difficult to maintain the volume and quality of the School’s applicant pool. There are internal challenges as well. The School’s revenue stream is heavily dependent on tuition, which limits Fletcher’s ability to quickly adapt to changing external economic circumstances. The School’s existing facilities constrain the expansion of face-to-face programming and research collaboration. The broad scope of our curriculum makes it hard to deliver targeted messages about the distinctiveness of a Fletcher education. The Fletcher School 2015 Strategic Plan has been developed to better position Fletcher at the forefront of global, multi-disciplinary graduate institutions in the coming years and to address the aforementioned opportunities and challenges facing the School. The plan offers a five-year roadmap, with annual reviews to assess progress against goals and make adjustments within core objectives, as required. If core objectives are not met, more far-reaching strategic initiatives will be considered. The plan, which anticipates that student enrollment levels will remain more or less constant, should help the School respond to student demand for greater career-orientation and ensure that students are prepared for their next jobs, for leadership positions and for meaningful careers. It should enable students to send a positive signal to potential employers and decision-makers about their professional readiness. Implementation of the plan should facilitate greater cohesion across faculty and administrative offices and will include a coordinated communications strategy to align all Fletcher materials and outreach efforts to ensure effective and consistent messaging.